Big brake upgrade specialists, Fastbrakes is pleased to announce their upgraded high performance super light two-piece rotor for the Nissan 370Z Sport Models with the Akebono 4 piston caliper. Although the 370Z is blessed with great brakes, they can be made better. The Fastbrakes 370Z two-piece rotors feature a directional vane design, with mounting hats made of anodized for corrosion resistance, 6061-T6 aluminum. The two piece design results in a rotor weighing an amazing 12 pounds less per rotor than the stock Nissan rotors. That's 24 pounds less power sucking and hard to stop rotating weight. Those 24 lbs are all critical unsprung weight as well so the difference in ride and handling can be felt.. 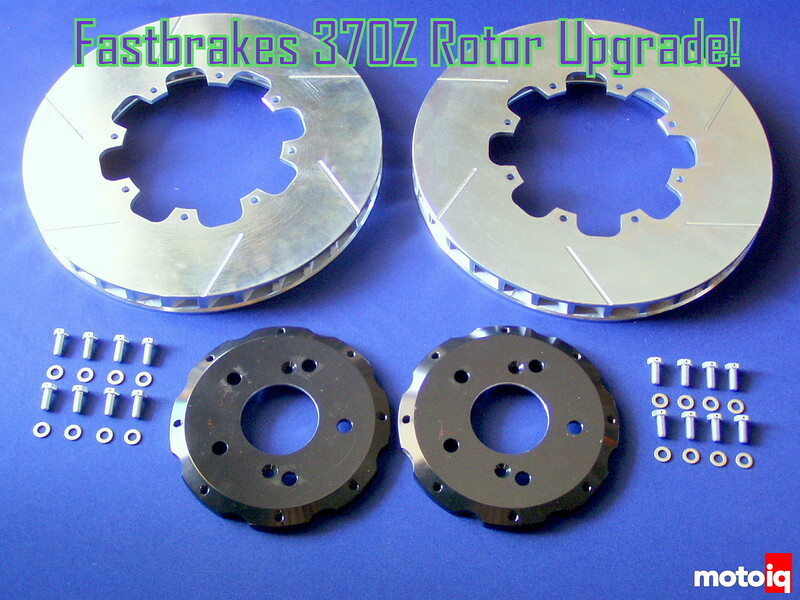 The Fastbrakes 370Z rotors are available as both a fixed design and as a racing full floating design (for an additional cost). The rotors are the same thickness (1.25") and diameter (14")as the stock rotors . Fastbrakes uses either plated or stainless steel drilled head bolts.Replacement rotors are $200 each for the slotted fixed version, or $225 each for the slotted floating version. Customers can switch from fixed to floating, with the purchase of the necessary hardware, parts and rotors.